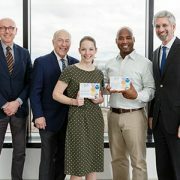 As part of Research and Education Week 2018, two Presidential awardees were recognized for their research contributions, Catherine “Katie” Forster, M.D., M.S., and Nathan Anthony Smith, Ph.D.
Catherine “Katie” Forster, M.D., M.S., and Nathan Anthony Smith, Ph.D., received the President’s Award for Innovation in Research honoring their respective research efforts to explore an understudied part of the microbiome and to shed light on an underappreciated player in nerve cell communication. Drs. 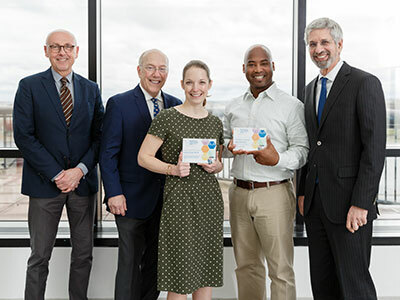 Forster and Smith received their awards April 19, 2018, the penultimate day of Research and Education Week 2018, an annual celebration of the excellence in research, education, innovation and scholarship that takes place at Children’s National Health System. This year marks the fifth time the President’s Award honor has been bestowed to Children’s faculty. Dr. Forster’s work focuses on preventing pediatric urinary tract infections (UTIs). Frequently, children diagnosed with illnesses like spina bifida have difficulty urinating on their own, and they often develop UTIs. These repeated infections are frequently treated with antibiotics which, in turn, can lead to the child developing antibiotic-resistant organisms. Powered by new sequencing techniques, a research group that includes Dr. Forster discovered that the human bladder hosts a significant microbiome, a diverse bacterial community unique to the bladder. Dr. Forster’s research will continue to characterize that microbiome to determine how that bacterial community evolves over time and whether those changes are predictable enough to intervene and prevent UTIs. 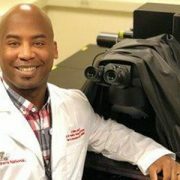 Smith’s work focuses on the role of astrocytes, specialized star-shaped glial cells, in modulating synaptic plasticity via norepinephrine. Conventional thinking describes astrocytes as support cells but, according to Smith, astrocytes are turning out to be more instrumental. 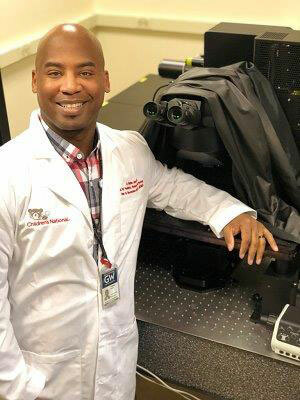 Norepinephrine, a neurotransmitter that plays an essential role in attention and focus, is released by a process known as volume transmission, which is a widespread release of a neurotransmitter at once, says Smith, a principal investigator in Children’s Center for Neuroscience Research. Astrocytes, which outnumber neurons in the brain, are strategically and anatomically located to receive this diffuse input and translate it into action to modulate neural networks.